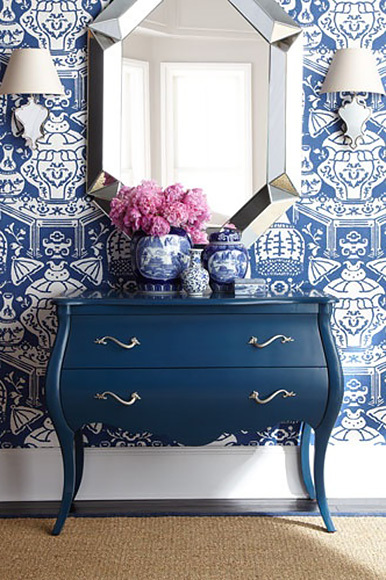 I am so happy that wallpaper is back in fashion. I used to teach a styles and trends module at a design school and I remember about 10 years ago setting a task for students to look for upcoming trends. The following week many of them came back excitedly with the news that they could see wallpaper coming back into fashion and they were so excited. Of course they were! This is a designer’s dream. To be able to use pattern and colour together on walls rather than just on accessories started to make our projects look much more interesting. Wallpaper has always been popular in some markets, for example in the UK, but in Australia 10 years ago, the trend was very much for simple painted walls and block colour to be introduced as a feature wall with wallpaper really considered outdated. Thankfully, since my students noticed that start of a trend here, I can happily say that wallpaper is now entrenched in our design world. 1) The classic stripe. 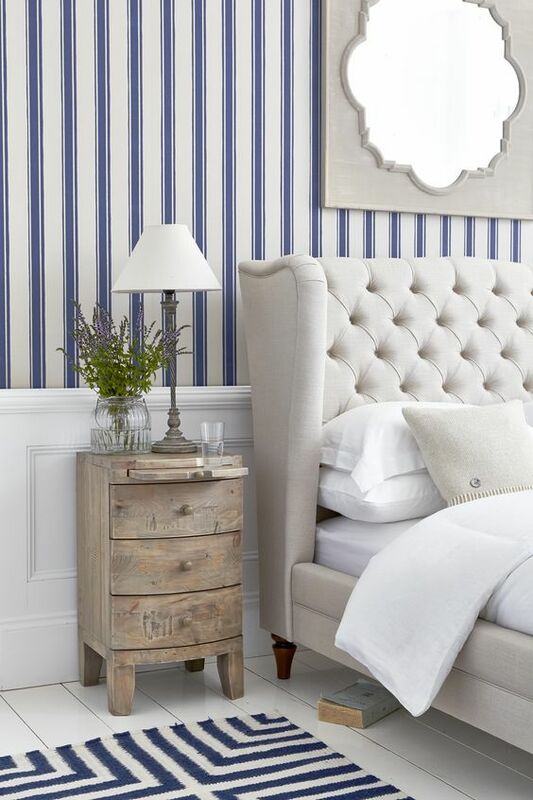 Probably one of the first to appear back on trend was the classic blue and white stripe design which endures to the present day and is perfect to use for either a teenage boy’s bedroom or a Hamptons style sophisticated living room. The strong tonal variation between the blue and white makes this a masculine choice and also an excellent design to use for coastal inspired schemes – it really is a winner across the board. 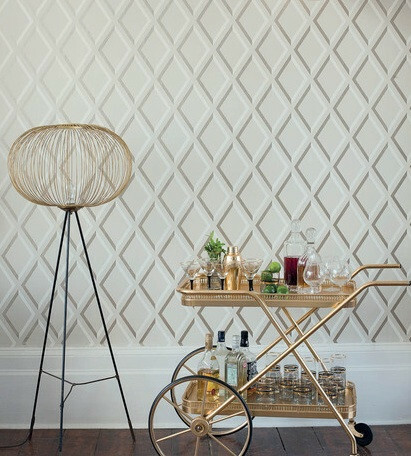 2) Gilded wallpapers. For those who love a bit of bling, these wallpapers are inspired as they allow you to bring a piece of glamour to a space without overwhelming it. Just a hint of gilding in a classic design can really set the scene for an afternoon of high tea in an English manor house or a touch of sophistication to a bedroom scheme. Very grown up! 3) The natural feel. 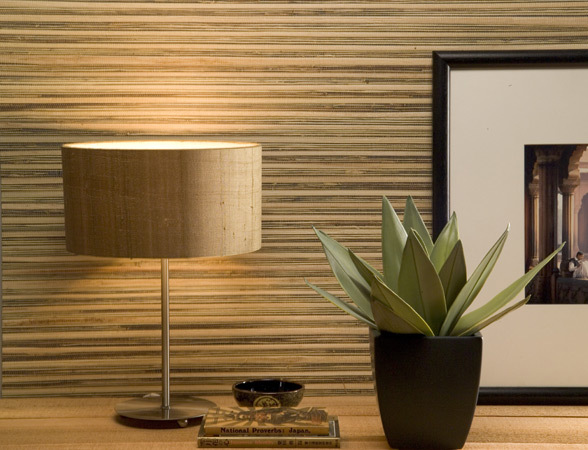 For those though who loved the hessian walls of the 1970s, this can be re-created with a sea grass weave wallpaper. Tactile to the touch and in natural hues of browns, orange and creams, these wallpapers really evoke the retro 70s feel and offer a simple alternative to a painted wall. Either in the natural look as shown here or available in beautiful colours – think the dark blues that are reminiscent of Don Draper’s study in Mad Men. 4) Florence Broadhurst. 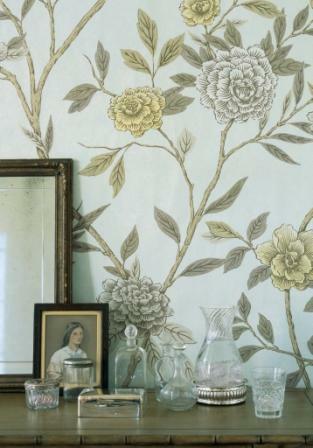 You can’t talk about wallpaper in Australia without including the beautiful designs from Florence Broadhurst. With wallpaper and textile designs spanning from the 1950s to the 1970s, Florence’s designs were ahead of her time. Her artistic talent was forged from spending time overseas in Asia, where she lived and travelled extensively and from her time working in upmarket Bond Street in London. Returning to Sydney in the 1950s, her head was full of interesting inspiration which comes through in her beautiful designs. A Sydney treasure – I love to use her wallpapers and fabric and in fact my inspiration board over my desk is made from one of her designs. 5) Elegant designs. Wallpapers that have contemporary versions of oriental designs are very elegant, particularly when in a simple and modern colourway. 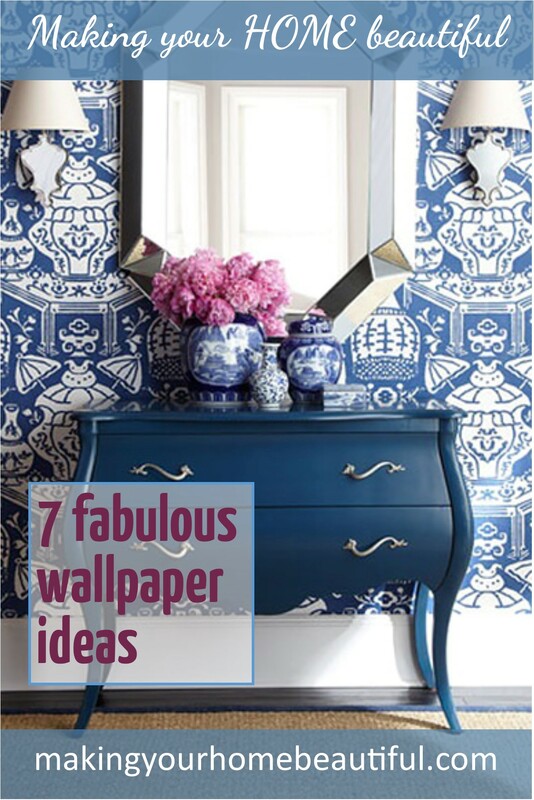 These wallpapers are reminiscent of artworks and make a very gracious statement in a decorating scheme. The designs are pretty but bold and the strong design element makes them a real feature rather than a fussy background finish. This is a great way to introduce pattern and colour and still retain a more masculine touch. 6) The classic Chintz. 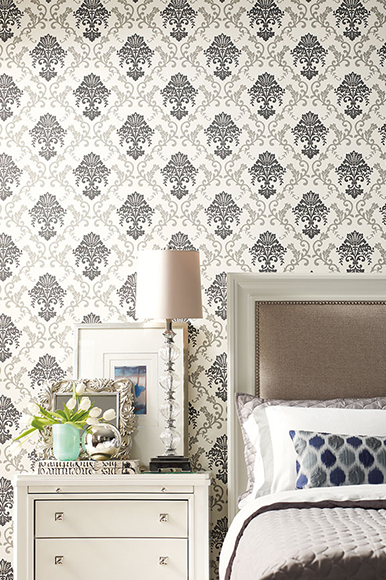 For lovers of floral designs, these more feminine wallpapers are perfect. Pretty is back in fashion as is the colour pink so for those who have felt denied for years, it is acceptable again to adorn your walls with beautiful appealing chintz designs. To maintain the pretty feel but keep the palette more neutral, you can opt for natural soft greens and yellows. 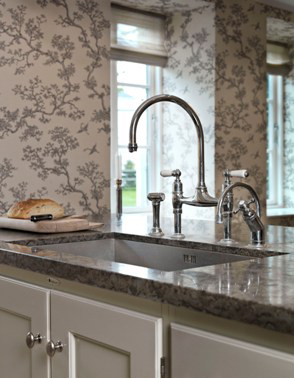 Reminiscent of an English country cottage, these are designs that I grew up with and love to this day. 7) Funky geometric. The strong lines of geometric prints work well for a mid-century modern revival look or a very contemporary scheme. The formal repetition of the design is simple but very effective and makes an excellent background for more organic style accessories. For example a round or oval mirror looks great on a geometric print wallpaper as it breaks up the strong pattern and makes a nice design statement. A soft floral artwork can also look effective. Remember that you can mix geometrics, stripes, plains and florals with cushions and you can do the same with artworks on a geometric background. Just ensure that you create a colour link and the effect will be very eye-catching. These are just a few of the examples on the market – I really could go on forever with the fabulous inspiration that is around the world at the moment. If you love wallpaper too, there are lots of ideas on my Pinterest account and I would love to hear your experience of using wallpaper in your decorating schemes. Do you like to use it for an entire room or just a feature? I hope to hear from you in the comments section below! So curious about removable wall paper and raised wallpaper ?? Thanks a lot for the blog! your ideas are actually fabulous. The walls are looking really beautiful in pictures. I will definitely apply some of these ideas for my own home.